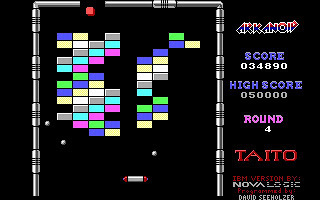 Arkanoid is a real classic arcade game. The Dos version comes with 16-color EGA graphics. Good enough for showing the bricks. 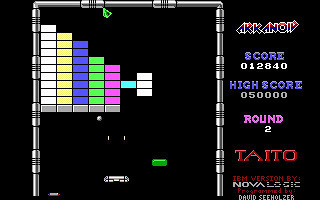 In Arkanoid, we control a spaceship, block a ball and hit all bricks in the screen. There are some monsters that will block the way. 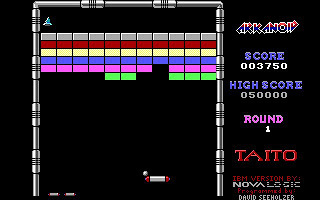 The good part of Arkanoid is the various kind of power that we can collect during the game. Some will give us the power to stick the ball on our ship. Some will make our ship longer. Some will give us 3 balls at the same time. 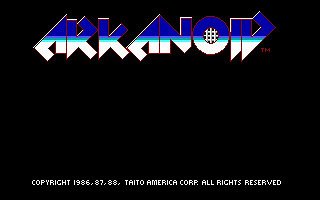 You can download Arkanoid here.